As development encroaches upon once wild land, people and wildlife are forced to come into closer contact. Unfortunately, this often creates deadly hazards for our wildlife, such as the opossum. Here are some ways you can HELP the opossums. The below informational links are not identical to each other. Please search each one for a small mammal rehabilitator nearest you. Two of these websites were apparently created and posted by volunteers and are not updated regularly. Some people listed are deceased or are no longer rehabilitating wildlife, their name horribly misspelled, email and telephone numbers incorrect. Please be patient in your search and not give up if the person or organization is not reachable on one site, the correct information may be on another site. 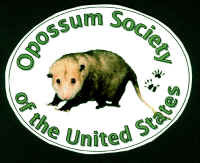 The Opossum Society of California (dba Opossum Society of the United States) has been approved by Ralphs grocery store for their Community Contribution Programs for charitable organizations incorporated under 501(c)3. First, if you don’t have a Ralphs Reward card, you need to sign up for your free card at your local Ralphs grocery store customer service desk. Once you have your Ralphs Reward card, you must create an online account with your Ralphs Reward Card at www.Ralphs.com and click on No Account? Register. Don’t forget to enter your “preferred Ralphs store” by city and state or type in a ZIP code and choose a store. After you create an online account with your Ralphs Reward card, you may register for the Ralphs Community Charity Program by returning to www.Ralphs.com and click on Community, then Ralphs Community Contributions Program, and then click on Enroll Now. The Opossum Society of California NPO number is FK048. Don’t forget to click on the circle to the left of our organization’s name. Once you register the Opossum Society of California as your designated charity Ralphs will donate back to OSUS 4% of your purchases (up to $500.00 monthly). OSUS would receive 5% if your purchases are over $500.00 (monthly). Purchases of alcohol, tobacco, pharmacy, postage stamps, gift card/gift certificates, lottery/promotional tickets, fluid milk and milk products, fuel CRV and Sales Tax are excluded from eligible purchases. You can help by asking your California friends, family and neighbors if they would be willing to register their Club Card with the Opossum Society of California. Encourage your friends and family to sign up for a card if they don’t have one and shop at Ralphs to help the opossums. Ralphs also credits Food 4 Less purchases. For those of you in northern California, you may register your CALA Foods or Bell markets Club Card number in addition to all the other information requested above. If you have already registered your Ralphs Club card with another charity, you can change charities to the Opossum Society of California. Every September 1 (or later), participants must renew their Ralphs Community Contribution Program online. Participants must renew on or as close to September 1 as possible as the program clears itself every August 31 (even if you just signed up for it on August 30). If you can’t renew online at www.Ralphs.com , call 1-800-443-4438.
assigned a password. Please be assured, Ralphs has a trusted, secure website. This means you have previously entered your email address and assigned yourself a password. Problem: Dogs and cats are the main predators of urban opossums, especially young opossums. Bites can be serious leading to infections, punctured organs, broken bones, nerve damage and death. Solution: Keep pets indoors or in the garage at night. Keep dogs on a leash. If cats must stay outdoors then fit with a collar with bells to warn the opossums. Cats do not pose a threat to adult opossums but the young opossums are at risk. If a dog must stay out at night then try to confine to a run or small section of the yard away from an area opossums may travel. Place an 8-inch diameter, 5-6 feet long PVC pipe in the yard so that the opossum can escape from a dog. Problem: Many opossums are killed each year on the road. Solution: Drive slower at night, preferably in the center lane so you will have more time to react if an opossum crosses the street. Give opossums a “brake”! If you see a dead opossum on the road then move it to the side of the road, if safe to do so, and check to see if it is a female with young in the pouch. If an orphaned or injured opossum is found then contact the Opossum Society of the United States, a local wildlife rehabilitator, veterinarian, or animal shelter. Problem: Many opossums suffer painful deaths from poisoning. Solution: Do not use poisons. Opossums, other animals and children may be harmed and/or killed inadvertently. Clean up any spills, especially sweet-tasting antifreeze. Do not use rat poison. If you suspect an opossum may have been poisoned then contact a veterinarian or rehabilitator immediately. It would be helpful if you have information about the poison, name, active ingredient, possible time of ingestion, and any signs or symptoms displayed by the animal. Problem: An opossum may drink from a pool, fall in and drown. Solution: Keep the pool covered at night. Drape an anchored towel or rough-textured hose over the side of the pool so the opossum can pull itself out. Leave a bowl of water nearby so the opossum will not drink from the pool. Problem: Opossums do not wear shoes. Broken glass will cut their delicate feet. Wire, string, plastic bags and other garbage can be deadly.